Have you ever thought about what you really mean to the Father. I am sure that you have. Just as I have, as a fleeting thought in a moment of time. But let’s go to the Word of God to really see what we mean to Him and really to all of creation. In Ephesians 2:10, the Word declares, with a loud and mighty voice, “We are God’s workmanship, created in Christ Jesus born anew that we may do the works which God Himself predestined for us to do. You need to know that God had His eye on you before you loved Him. 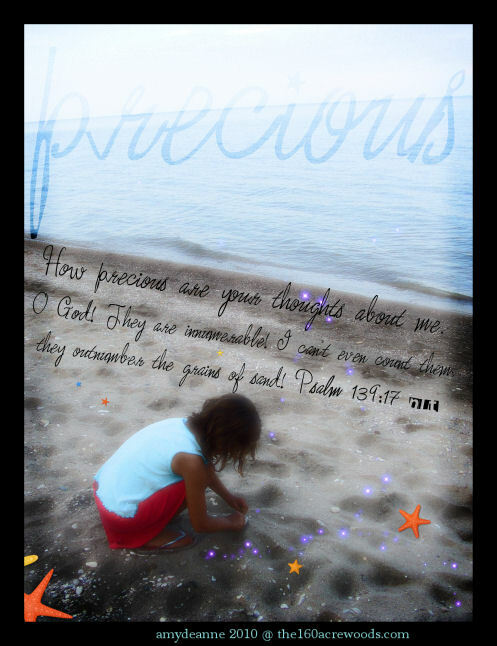 You are created in His image and you are not something to just be thrown away or tossed aside. You carry within yourselves a great treasure. You are a gold mine waiting to be opened to His glory. As I write this word I am listening to a song called Abba. Abba means Daddy or Papa. He is to be so real to us that when we breathe we are breathing Him into our lungs. When we touch our arms we should feel His arms around us. As we walk and look down at our feet we should see His feet there. As we come into oneness with Him we will be able to walk in total freedom. And thus be able to set creation free. That means all of creation. Now, just so you understand I am nowhere near this yet. But I seek to be there. The creation itself groans for the manifestation of the sons of God to come forth. Stop for a moment and really dwell and think on these thoughts. Ponder them as my dear friend says. Let them sink in to the very depths of your spirit, soul and yes, even your body. As you ponder on the greatness of our God and who He created you to be; how you are called to be a co-laborer with Christ to see the Kingdom of God to come forth in you, it will totally blow you away and you will never be the same. Now be blessed this day to grow and mature in all the potential, skills, character and great magnificence that you were created with, to be a blessing to others. And yes, to set creation free… Be blessed to be who you are, in Him. Carol Hartsoe, Purveyor of His Presence Ministries. First and foremost I am a seeker and lover of God. I have been married for 35 years to a wonderful man. We have two grown children and two grandsons that we adore. My intention in life is help God’s people to come into the throne room and become one with the great I AM. For His people to truly know who they are and the power that they have through Jesus. Beautiful!!!!!!!!! I loved this. Thank you , sweet , sweet, Carol. This is a keeper, I may print this out and put in my Bible. Thank you honey, for speaking out our Precious Lord’s wisdom and truth. Love ya honey! Great Word my BFF! Let’s keep on going forward to where the LORD wants us to be. Love U!